Whereupon Garab Dorje was moved, and his hand reappeared, in which was a small golden casket, the size of a thumbnail, containing the teaching of Hitting the Essence in Three Words, which he let fall into the hand of Mañjushrimitra. 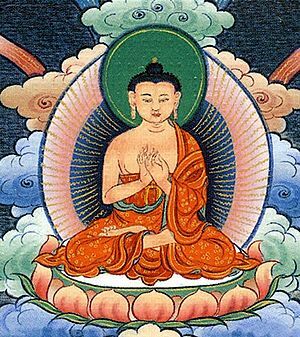 As soon as he received it, his mind became the same as the wisdom mind of his master Garab Dorje. Mind’s nature is and always has been Buddha. No-one has created it - it is just the Dharmakaya". ↑ Garab Dorje is best known by the Tibetan version of his name. Various attempts have been made to reconstruct his name in Sanskrit, usually giving it as Prahevajra, but also as Pramodavajra or Surativajra. ↑ Zenkar Rinpoche says that the text has a variant reading, མ་བརྩོལ་ meaning “without effort.” However both mean without mental fabrication or manipulation. Reynolds, John. Golden Letters (Ithaca: Snow Lion, 1996), Part Two, 'The Life of Garab Dorje and Guru Sadhana'. This page was last edited on 14 April 2012, at 12:32.